CCTV visuals showed the gang stealing the parked vehicle from Parappallil service station at 11.45 pm on Thursday. KOTTAYAM/KOCHI/THRISSUR: An overnight ATM robbery covering the state’s three districts in a span of just five hours on early Friday morning saw Rs 32.60 lakh looted from the machines of SBI and South Indian Bank, catching the police on the wrong foot. A three-member gang was on a rampage, robbing Rs 22 lakh and Rs 10.6 lakh from ATMs at Irumbanam (near Kochi) and Koratty (near Thrissur) respectively while failing in their loot attempts in Kalammassery and Kottayam, from where the gang robbed a Bolero pick-up van (KL5 AA 4458). CCTV visuals showed the gang stealing the parked vehicle from Parappallil service station at 11.45 pm on Thursday. “From the modus operandi adopted to rob at Irumbanam and Koratty, we strongly suspect these cases are interlinked. Two unidentified persons entered the ATMs and sprayed paint over the CCTV camera. They cut the machines using gas-cutter type machine. We’ve received the accused persons’ images. We’ve launched a manhunt and they’ll be in our net soon. We suspect inter-state group behind the incident,” said Kochi City Police Assistant Commissioner P P Shams. The robbery attempts commenced in Kottayam district, where the gang made futile attempts at SIB, Vempally (1.10 am) and SBI, Monippally (1.40 am), both near Kuravilangadu. The robbers destroyed outside cameras at the counters. “However, they didn’t touch the machines. 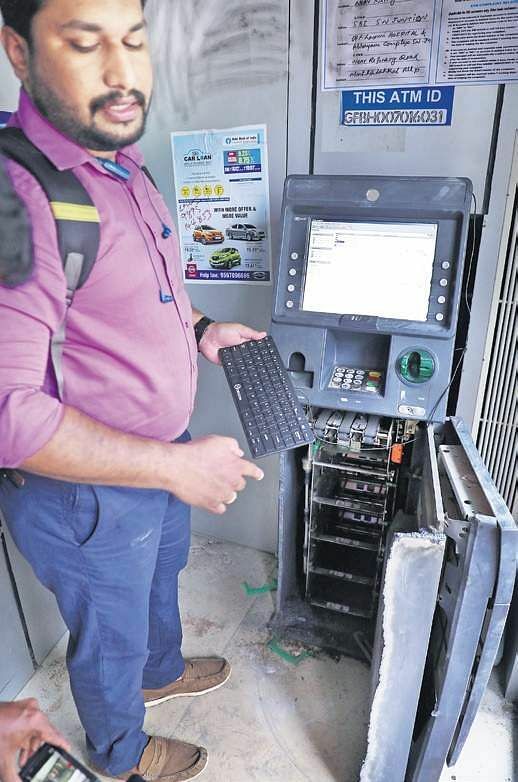 It may be because of the apparent presence of some vehicles or police, which frequently visit these ATMs,” said Kottayam district police chief Hari Sankar. The gang reached Irumpanam at 3.15 am on Friday. After successfully breaking in there, the trio moved towards Koratty. On their way, they tried to rob another ATM in Kalamassery. However, when the alarm went off, they left the place. The robbery at Koratty took place at around 4.30 am. All these incidents have taken place between 12 midnight and 4.30 am and all targeted ATM counters where without security persons. “One person drove the vehicle while two others did the robbery. We suspect the involvement of inter-state gang behind it. A coordinated effort by police teams in Kochi, Thrissur and Kottayam is taking place, “ said a police officer.Police have passed on the images of the accused to various stations to prevent the accused from leaving the state. Meanwhile, the Bolero pick-up van was found at the Chalakkudy ground. According to Koratty SI Subishmon K S, the vehicle did not pass through Paliyekkara toll plaza, and hence there are chances of them fleeing the state with the money.